Q: Recently, Saudi Arabia intercepted a ballistic missile which was launched by Yemen's Houthi forces to its capital, Riyadh once again. Saudi Arabia said that with the support of Iran, this missile was targeted at Riyadh's residential quarters, which violated the relevant resolutions of the UN Security Council and the international human rights law and threatened the security of Saudi Arabia, the region and the world at large. What is your comment on this? A: We have taken note of the relevant report. The Chinese side is always opposed to any action targeted at civilians that will escalate and enlarge the scale of conflict. The military conflict in Yemen has lasted for over two years. The pressing task now is to call upon relevant parties to engage in dialogue and negotiation on the basis of the relevant resolutions of the UN Security Council, the initiatives of the Gulf Cooperation Council and their implementation mechanism and the outcome documents of Yemen's national dialogue conference so as to find an inclusive solution at an early date. Q: It is reported that Foreign Minister Wang Yi today held talks with Venezuelan Foreign Minister Jorge Arreaza. Can you provide us with the relevant information about the talks? A: Foreign Minister Wang Yi held talks with Foreign Minister Jorge Arreaza of Venezuela who is on an official visit to China at noon today. The press release will soon be issued. During the talks, Foreign Minister Wang Yi said that the Chinese side attaches great importance to developing China-Venezuela relations and stands ready to enhance exchanges in various areas and at all levels with the Venezuelan side. On the issues involving each other's core interests and major concerns, the two sides will support each other and follow the principle of mutual benefit and win-win cooperation to steadily expand pragmatic cooperation so as to deliver benefits to the two peoples and fuel regional development. Foreign Minister Wang Yi said that Latin America is the natural extension of the 21st-Century Maritime Silk Road. Many Latin American countries said that they are willing to participate in the international cooperation under the Belt and Road Initiative and we welcome that. We are willing to work with the Latin American countries to align development strategies, tap cooperation potential, expand the room for cooperation and achieve common development based on the principle of extensive consultation, joint contribution and shared benefits within the framework of the Belt and Road Initiative. Foreign Minister Wang Yi pointed out that the stability and development of Venezuela not only serves the interests of the Venezuelan people but also represents the shared aspirations of China and other members of the international community. The Chinese side wishes that the situation in Venezuela can maintain the momentum of stabilization and encourages relevant parties to tackle the existing issues through dialogue and consultation within the legal framework. Foreign Minister Wang Yi said that we should respect the right enjoyed by one country to pursue the development path that suits its own national conditions. Foreign Minister Jorge Arreaza said that the Venezuelan side warmly congratulates the Chinese side on successfully holding the 19th National Congress of the Communist Party of China, highly recognizes China's vision on national governance and diplomacy and appreciates that China adheres to its objective and just position on international affairs. China is a priority direction of the diversification of Venezuela's diplomacy. The Venezuelan side will actively advance the Belt and Road Initiative with all relevant parties and expects that the China-Venezuela pragmatic cooperation can have more deliverables. Foreign Minister Jorge Arreaza said that developing relations with China in a comprehensive way represents the consensus of the Latin American and Caribbean countries. The Venezuelan side is willing to take an active part in the Second Ministerial Meeting of the Forum of China and the Community of Latin American and Caribbean States (CELAC) and promote the profound development of China-CELAC relations. The two sides also had an in-depth exchange of views on international and regional issues of common concern. 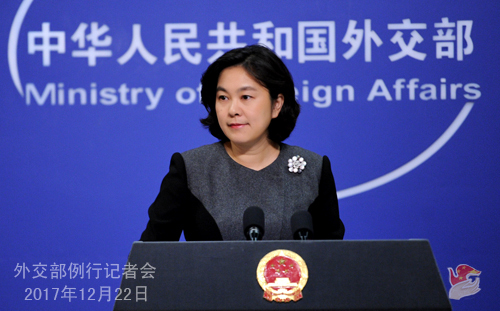 Q: It is reported that the 20th round of border talks was held between India and China in New Delhi. Could you tell us what transpired at the meeting? Was the Dong Lang issue discussed during the meeting? A: On December 22, member of the Political Bureau of the CPC Central Committee and State Councilor Yang Jiechi traveled to India to hold the Special Representatives' Meeting on the China-India Boundary Questions with National Security Adviser Ajit Doval of India. The Special Representatives' Meeting on the China-India Boundary Questions is not only a high-level channel for the two countries to hold talks on boundary questions but also an important platform for them to conduct strategic communication. In September this year, President Xi Jinping met with Prime Minister Narendra Modi in Xiamen and reached important consensus on further developing China-India relations. During this Special Representatives' Meeting, in accordance with the requirements of the two heads of state, the two sides will exchange views on bilateral relations and major international and regional issues of common concern, properly manage differences, focus on development and cooperation, promote the sound and steady growth of China-India relations and achieve friendly cooperation, mutual benefit and win-win outcomes. Follow-up: Is there likely to be some sort of discussions in terms of creating additional mechanisms during this Special Representatives' Meeting? A: Leaders from both India and China attach great importance to boundary questions. Over the years, we have seen that the two sides have made tremendous efforts to settle the border issues. The Special Representatives' Meeting on the China-India Boundary Questions has been held 19 times. Now State Councilor Yang Jiechi is in India to have an in-depth exchange of views with the Indian side on bilateral relations and issues of common concern. We believe that the mechanism of special representatives' meeting is working well. We are willing to maintain close communication with the Indian side and take full advantage of the existing border-related mechanisms to uphold the peace and tranquility of the border areas and create enabling conditions for the sound and steady development of bilateral relations. Q: There is a report saying that starting from January next year, China will ban organizing group tours to the ROK in Shandong province. Can you confirm this? If this were true, would it go against the consensus reached by the two heads of state on promoting the improvement and development of China-ROK relations? What is your comment on this? A: According to my information, the relevant report mentioned by you is inconsistent with the fact. A couple of days ago, I have said on this podium that President Moon Jae-in's state visit to China is successful. The two heads of state have reached many important consensus on promoting the improvement and development of China-ROK relations. We stand ready to work with the ROK side to earnestly follow through on the important consensus reached by the two heads of state. The Chinese side holds an open and positive attitude towards conducting exchanges and cooperation with the ROK side in various areas. We hope that the ROK side can make concerted efforts with China to create enabling atmosphere and conditions for the exchanges and cooperation in various areas between the two countries. Q: According to media reports, Canada and the United States announced Tuesday that they will hold a summit of foreign ministers in Vancouver on January 16, including envoys from Japan and the ROK to seek progress on the Korean Peninsula crisis. What is your comment on this? Has the Chinese side communicated with the relevant parties about its possible attendance at this summit? A: The Chinese side welcomes the efforts that are conducive to resuming dialogues and promoting the political and diplomatic settlement of the Korean Peninsula nuclear issue. The current situation on the Korean Peninsula is complex and sensitive. Resorting to the Cold War mentality again, being bent on imposing pressure and creating confrontations are not conducive to the abatement of tensions on the Korean Peninsula or regional peace and stability. All relevant parties should do more things which can help to de-escalate the tensions, enhance mutual trust and promote the peaceful settlement of the Korean Peninsula nuclear issue through dialogue instead of doing the opposite. Q: It is reported that the groundbreaking ceremony for the first phase project of the China-Thailand railway was held in Thailand on December 21. Can you provide us with the detailed information on that? What are China's expectations for the future development of this project? A: On December 21, the groundbreaking ceremony for the first phase project of the China-Thailand railway was held at Pak Chong district of the province of Nahon Ratchasima, Thailand. Premier Li Keqiang sent a message of congratulation to the ceremony and Thai Prime Minister Prayut Chan-o-cha attended and addressed the ceremony. Nearly 400 people from the two countries' government departments, enterprises and media were present at the ceremony. The China-Thailand railway project is a flagship project for the two countries to jointly advance the Belt and Road Initiative and carry out production capacity cooperation. This project, which embodies the spirit of extensive consultation, joint contribution and shared benefits, will effectively enhance the infrastructure building and connectivity in Thailand and the whole region. We hope that the two sides can maintain close cooperation, strive for the connectivity between the China-Thailand railway and China-Laos railway at an early date, bolster trade and economic and people-to-people exchanges between the counties along the route and achieve all-win outcomes. China is willing to seek greater synergy between its own development strategy and that of Thailand and employ the China-Thailand railway project as a platform to constantly advance mutually beneficial pragmatic cooperation between the two countries and promote the greater development of the China-Thailand Comprehensive Strategic Cooperative Partnership. 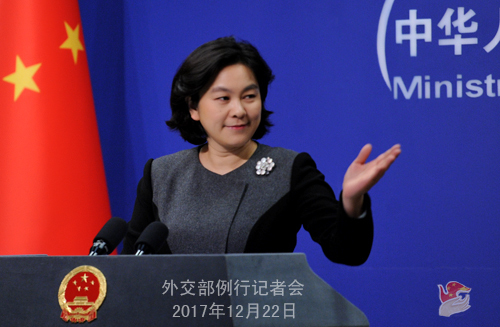 Q: It is reported that the UN Security Council is likely to vote on a resolution which will impose new sanctions on the DPRK on the early morning of December 23, Beijing Time. How does the Chinese side view this draft resolution? A: Presently, the situation on the Korean Peninsula is grave. The pressing task now is that all relevant parties should exercise restraint, implement the existing relevant resolutions of the UN Security Council in a comprehensive and strict way and create needed conditions for the early resumption of dialogue and negotiation and the peaceful settlement of the Korean Peninsula nuclear issue. The UN Security Council's consultations, actions and responses should help to uphold its solidarity and cooperation, safeguard the peace and stability on the Peninsula and promote the peaceful settlement of this issue through political and diplomatic means. The Chinese side is willing to adopt a responsible attitude to maintain communication with all relevant parties in this aspect. Q: Does what you said just now mean that China supports the new resolution being passed? A: What I said just now is that we believe that the actions taken by the UN Security Council should help to uphold its solidarity and cooperation, realize the denuclearization of the Peninsula, safeguard the peace and stability on the Peninsula and promote the peaceful settlement of this issue through political and diplomatic means. Q: According to media reports, yesterday, the ROK police uncovered a telecommunication fraud group which is composed of 51 people in Jeju Island. Most of them come from Taiwan and their targets include people from the mainland. Over the past one year and a half, the number of Taiwan telecommunication fraud suspects sent to the mainland by foreign countries is over 200. Does China hope that these suspects can be sent to the mainland? A: We have taken note of the relevant report. According to our information, this case is under investigation now. The Chinese Consulate-General in Jeju Island has contacted the ROK police to learn more about this case and verify the identities of the people involved. In principle, we always require the countries that have established diplomatic ties with China to deal with the Taiwan-related issues in accordance with the one-China principle.